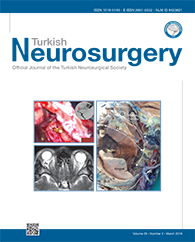 2Cumhuriyet University, Faculty of Medicine, Department of Radiology, Sivas, Turkey DOI : 10.5137/1019-5149.JTN.21108-17.4 AIM: To assess the role of triangular vertebral canal shape (VCS) in pain severity, pain-related findings, and postoperative satisfaction in patients with lumbar spinal stenosis (LSS) who had undergone decompressive surgery. MATERIAL and METHODS: This cross-sectional study conducted at a single center included 61 consecutive patients who had undergone surgical treatment for LSS. By comparing pre- and postoperative data, the role of triangular VCS in pain severity [assessed using a visual analog scale (VAS)], pain-related findings, and postoperative satisfaction of patients was examined. VCS was determined to be triangular, oval, or circular based on magnetic resonance imaging (MRI) and magnetic resonance myelography (MRM) findings. RESULTS: Preoperative VAS scores of patients with triangular VCS were significantly higher than those of patients with oval and circular VCSs (p<0.05). No significant difference was found in postoperative VAS scores among patients with triangular, oval, and circular VCSs. In all subgroups, postoperative VAS scores were significantly lower than preoperative scores (p<0.05). This postoperative decrease in VAS scores was significantly higher among patients with triangular VCS than in those with oval or circular VCS (p<0.05).